Many plants from one motherplant! How to build EBB & flood? 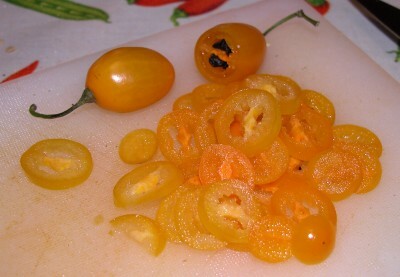 Fatalii Gourmet Jigsaw - As hot as it gets! Smoking Chiles with Bradley Smoker! 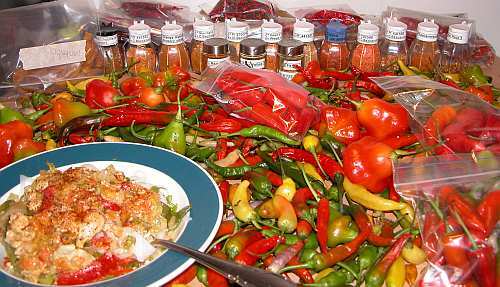 Chiles can be processed in many different ways after harvesting. Always use as many pods as possible when they're still fresh! Chop them for different dishes, like barbeque food, rice and chicken, salsas, tortillas, tacos, sandwiches... just use your imagination! There are lots of different varieties which can make food taste different every time! Sandwiches are a great example, try using Lemon Drops or Habanero with the same type of bread! There's a big difference in heat, but even bigger difference with the taste! Chop the chile peppers very small if they're too hot to use as big slices, that way it's possible to control the heat very well! I prefer the breads more like tasty than killer hot. at their fresh form, here are some solutions for that problem. 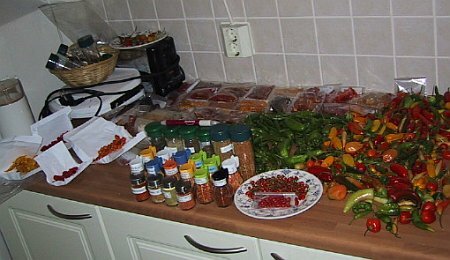 Perhaps the easiest way to preserve chiles, just keep in mind that it will affect the taste. When cooking, this won't be a problem with most of the dishes. I cut pods in half before freezing them, except for the tiny pods which I freeze whole. Put the splitted pods into the ziplock-bags and put them into the freezer. Frozen pods in ziplock bags. They should last all year long. 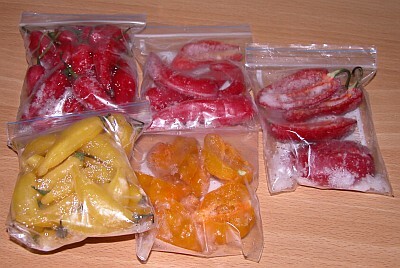 ziplock bags or freezing containers. My favorite way of preserving. 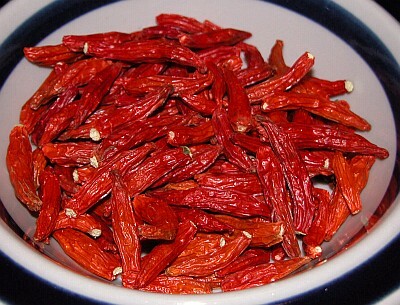 Smoked chiles are called chipotles. Very interesting and addictive stuff, especially as a powder! 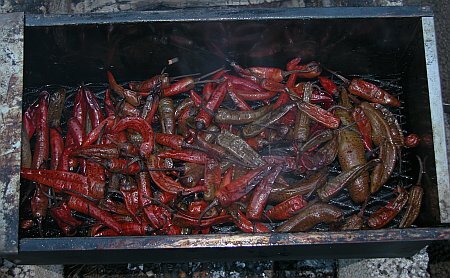 You can use small smoker which works well, although it affects the aroma of the pods quite a lot by cooking the chiles in small container that gets quite hot during the smoking process. In other words, the chile loses lot from it's aroma but the taste of the smoke will still be very strong. Small smoking box for smaller amounts. Or for some serious smoking, you can build a smoking oven which ensures premium quality. still clearly present, along with the smoky taste! 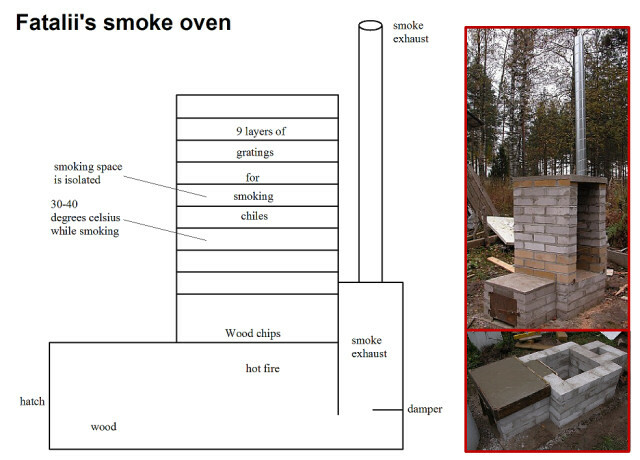 Click the picture if you're interested in building smoking oven of your own! In the big smoking oven the temperature in the smoking container isn't too hot. possible to taste the characteristics of the specific variety. Also, the aroma of the smoke will be significantly different depending on the wood brand you're using! 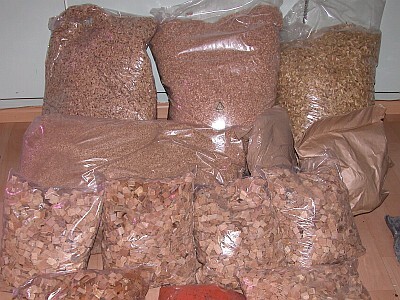 Different wood chips for smoking. You can also experiment mixing different woods for smoking. robinia and special smoking chips like the ones made out of Bourbon whiskey and Sherry barrels. I also tried using spices (spice mix and orange used as a spice) with smoking and they worked great! The aroma of the spices work great along with the smoky taste! My chile powders in kitchen shelf. Powdered chiles can differ a lot from the fresh ones with their aroma, some varieties taste very different compared to their fresh form. 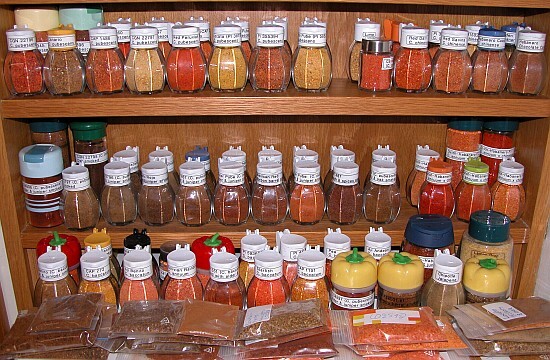 With different chile powders, you can add quite a lot variation for different dishes. 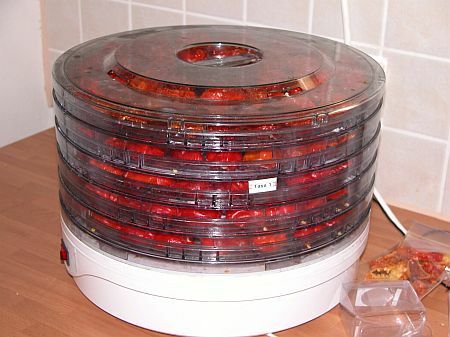 For powdering the chiles, dehydrator is highly recommended. Split the pods which will be dehydrated. Some smaller, thin fleshed varieties will dry propely without splitting the pods. Remove the seeds before or after the drying, depending on the variety, you just have to experiment and see which is the easiest way to preserve the seeds. If you choose to collect seeds when the pods are still fresh, make sure to dry the seeds well, also label them correcly. Pods can be also dried and powdered with seeds, it affects the taste a bit but not too much. In some warmer and drier countries, it's possible to sun-dry the pods quite easily. Smaller amounts can be dried in warm places like on top of the radiators, amplifiers, monitors, lamps, floor heating etc. After drying the chiles collect the seeds if you like, unless didn't do it when the pods were still fresh. Now it's time to start grinding the pods! 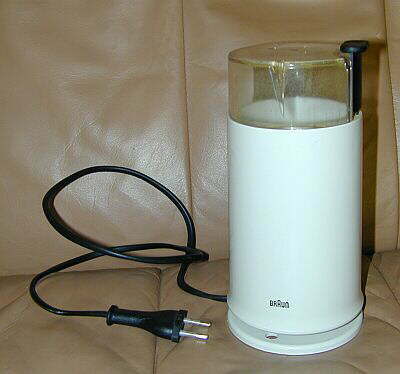 Most effective tool for this is electronic coffee mill. I've used few different brands with blades and one brand with stone mill system. The mills with blades are usually more reliable choice for grinding. Some mills with stones won't work very well, and some work just fine. I use food processor to break the chiles into smaller pieces first when using the grinder with a mill stones, that way it works just fine. The mill with stones could be a better choice for grinding super-tough dried chiles like rocotos which are almost hard as a stones when dried properly. 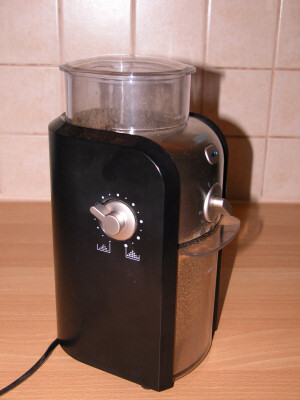 Grinder with a mill stones. Grind the powder as coarse or fine as you like and can and label the powders. You might be suprised to see how small space will your harvest fit in! 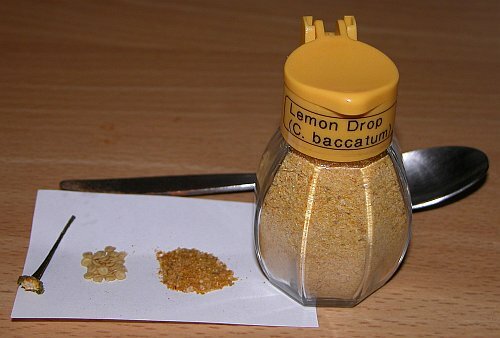 Left: one Lemon Drop pod grinded, right: contents of a small powder can. 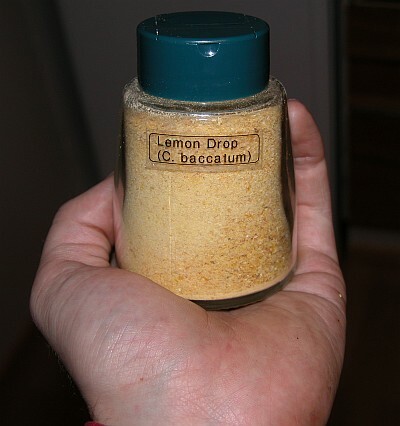 a small can full of Lemon Drop powder. It took 150 Lemon Drop pods to fill up this jar.